I first met Sonya Nimri on an episode of Craft Lab. She showed up with a ton of duct tape in a rainbow assortment of color and we proceeded to decorate a room with a circus theme. She had me at rainbow colors, but throw in a circus and all bets are off! This was my kind of crafty girl. Just when I thought I couldn’t dig her crafty chili anymore she comes out with a wonderfully luscious new jewelry book called Beadalicious. 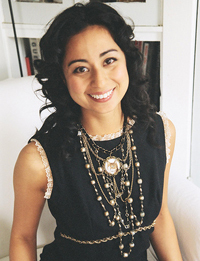 The book focuses on reinventing, revamping and up cycling old jewelry. It is a familiar theme with a fresh spin. 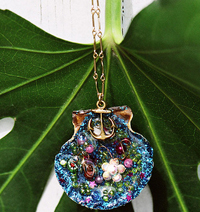 Think of earrings shaped like cherries and sparkly resin filled sea shell pendants. Did I mention the recipes and the rain boots? 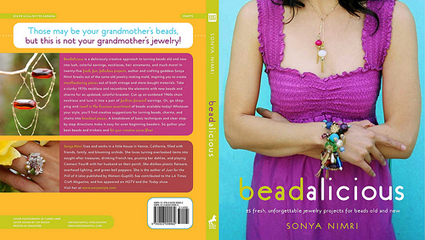 For anyone who is smitten on how-to jewelry books Beadalicious is one you should have in your collection. As someone who themselves is in the process of putting a book out I wanted to get the full scoop from Sonya about Beadalicious so I did a little interview to get the goods. The tag line on the Beadalicious press release says “those may be your grandmother’s beads, but this is not your grandmothers jewelry”. Were either of your grandmothers fashionistas with a great stash of baubles that helped inspire any of the projects?. I have both of my grandmothers costume jewelry and one had enough to fit inside a box of cards and the other had 2 giant jewelry boxes full. They were both equally loveable, just one happened to be a little more fashion savvy. Neither of my grandmothers actually wore much jewelry. They grew up overseas so where they were from costume jewelry wasn’t in fashion at the time. Most of my jewelry comes from my husbands grandmothers who were costume jewelry horders! I have tons from them. Some of it is really wild and outdated but after you take the beads apart and recombine it with newer beads, it becomes just fab. That is probably what’s good about it not being from my side of the family, I’m not too attached to it and don’t mind disassembling it all. I love that you snuck in recipes as your sidebars. I must confess my favorite margarita cupcake recipe makes an appearance in The Naughty Secretary Club: The Working Girls Guide to Jewelry. What inspired you to include recipes along with jewelry projects? I love food and grew up loving to cook as well as craft. The title Beadalicious implies juicy, mouthwatering, creamy- everything to do with food. Bringing in the elements of juicy fresh cherries, deep sticky caramel, and creamy dips just seemed to go. Plus, beading works up an appetite- and a girl’s gotta eat! The name Beadalicious is a bit deceiving because as I mentioned not only does the reader get amazing jewelry projects and recipes there is also the extra goodies section tucked away in the back of the book. It’s like a hidden bonus track on a CD with daisy covered rain boots and book mark projects. As an ADD crafter I loved that about the book! What made you decide to throw in these fun non bead related projects? For me beading isn’t just about jewelry and I wanted my book to reflect different ways of using beads to make fun gifts for friends or just ideas of ways to use them besides the obvious. Also, many times beads come in bulk and after a project is over you still have a gazillion more beads that you may not feel a need to make yet another necklace with. I often travel to Los Angeles whether it be to see friends and have geleto in San Monica like you and I did or to film a few episodes of Craft Lab. Even after all my travels I am not sure where the best thrift stores in town are hidden. For all of us that collect vintage costume jewelry to re-create into something Beadalicious where are a few of your favorite haunts? I can’t wait till the next time you’re here for another round of gelato! I’m such an addict and have an adorable place in Venice that we can ride bikes along the beach to the gelato place from. Thrift stores are really hit and miss depending on their shipment. I once scored three huge boxes of vintage fruit beads from a bead shop that had closed down at St. Vincent’s in Culver City but have been back since and haven’t found anything there. I shop at Goodwill and Salvation Army in Santa Monica, and love the Rosebowl flea market in Pasadena. I don’t actually have a “hidden spot” I go to regularly. I try my luck at different places and always keep my energy open to new beads coming into my life from wherever they may appear. The name Sparkles on the Half Shell cracks me up, but it also happens to be one of my favorite projects in Beadalicious. I love the brooch version! If you had to choose one project, what was your favorite to make? What about from Just for the Frill of it? Wow, Jen, That’s like choosing between children! I can’t say, I really love them all. I would say the one I wear the most is the “cosy nest” ring. It’s a ring in the shape of a bird’s nest. I get tons of compliments on it and it gives me a warm fuzzy feeling like I have someone’s delicate, precious, home resting on my finger. From my first book, Just for the Frill of It, I’d say my favorite project is the purse with ribbon trim and wooden handle made out of the neck of a turtleneck. It goes with everything! On the flip of that was there any one project in Beadalicious that about drove you to drink? There always seems to be that one project that is great in theory and concept, but when you start making it into a reality it about kills you. All the projects are really simple to make. But, I would say figuring out how to translate the “Cat Lady” from what I was seeing in my head was the most confusing part of writing the book. I knew I wanted it to be really long and Bohemian-Elizabethan. It was draping in all sorts of weird directions at first, and I couldn’t get it to hang right. It took a while and a few greyhounds to get me though it but now, for the reader it would be quite simple to make with the directions and graphs all laid out. I myself am partial to huge earrings (I can’t wait to make the Black and White Ball Earrings). What is your preferred jewelry staple? I find people are typically partial to one type of jewelry above all others. The world wants to know is Sonya an earring, brooch or necklace kind of gal? Sonya is a ring kind of gal. I like to play with them on my finger and spin the beads and band around. My Bohemian Wrapsody ring is ideal for fiddling with. You are a lady who always likes to have her crafty irons in oodles of fires. What is on the crafty horizon for Sonya Nimri? Any new books in the works? TV appearances I should set my DVR for (our foam crafts episode of Craft Lab is on HGTV June 16th by the way)? Booths at CHA were I might find you in July? At the moment, I’m working on a video for Craft: magazine’s blog- it’s going up next month. I’m also developing a video series for my website sonyastyle.com, easy fun crafts- each one is about a minute long. Besides that I just finished working on a craft dvd series with Raven-Symone that will be for sale at Wal-Mart soon. This Summer I will see you at the CHA! Yeah, I’m so glad you’re going to be there. I missed you at the last one! I’ll be at the Duncan booth in July as a guest designer and the Watson-Guptill booth signing both books. On a personal note, I’ve got a big bun in the oven at the moment. He’s a gigantic boy with really long legs and huge feet. He’s due right before Halloween so at the moment I’m deciding on his very first Halloween costume. Also, I’m trying to figure out what to name him. It’s really quite a task that will have a huge impact on this poor kid’s life so I’m trying to be very thoughtful about it. Thanks Sonya for the amazing interview and good luck cooking up that big ole’ baby of yours. I smell a baby craft book next! Posted May 21, 2008 & filed under Books, Craft Lab, Interviews, Jewelry. And Sonya, Congrats on a bun in the oven. Great interview! It’s amazing how big beading has gotten over the years. I’ve been buying my beads wholesale whenever i can, from places like this that sell Wholesale Costume Jewelry.